That year, the team must have been good. Being on this list does NOT necessarily make the player bad. It just means that he was that ‘other’ guy. Background: While the 1998 Mets lost the last five games to miss the playoffs, this team really gave the Mets what to cheer about. The Mets had some beloved guys in the bullpen led by Franco, Cook and Wendell. They had Mel Rojas who was loathed… and one guy who gets forgotten. Forgotten Met: Greg McMichael was a guy who was just there (except when he wasn’t. McMichael was traded away and then reacquired in that season). He pitched in 52 games, which isn’t something to sniff at. However, with an ERA of 4.02 and a WHIP of 1.733 he often gets forgotten by Mets fans. Over his three years in Queens he was a mediocre reliever. Background: When we think of this team many names come to mind, so here is a trivia question. Who are the 4 players to play 130 or more games for the 2016 Mets? Forgotten Met: Three are expected. Cesp, Cabby and Grandy. The fourth was Alejandro De Aza. Don’t believe it, look it up. This may come as a shock but iy’s true. Thanks to injuries to Lagares, De Aza played a lot for a guy who underperformed. True, he only started 45 games, but still he found himself playing in over 80% of games as a lefty pinch hitter. While his first half was abysmal, the second half was good enough. In the end since the Mets made the Wild Card game, all was forgiven and De Aza forgotten. Background: This squad was one of the greatest stories in franchise history. They seemingly came out of nowhere to take the division and win the pennant. The 2015 Mets are remembered for the pitching, but many of its hitters engraved their names in our memories. One became a hero, but would have been forgotten if not for a dirty slide. Forgotten Met: Ruben Tejada had a long but unremarkable career in Queens. Early on, he could hit for average, but not so in his later years. Tejada was not a slugger by any stretch of the imagination. His most famous home run was when the ball stayed in play but the right fielder went over the wall. We thought that he had a good glove but with a dWAR of -1.4 in 2015, he left a lot to be desired. The main reason we remember Tejada was because of the dirty slide by Utley. Background: After what seemed like an eternity of darkness, the light of the baseball gods finally shined on the Mets. 1984 was the start of a great time. Now let me ask you a surprisingly tough question. Which pitcher started the most games and who was his primary catcher? Forgotten Mets: Walt Terrell & Mike Fitzgerald. Terrell was not a bad pitcher, but he was not that great either. He started 33 games and put up a 3.52 ERA but his WHIP of 1.451 was high for a staff filled with names like Doc, Ron and Sid. His battery mate was a typical light hitting but good defensive catcher. Fitzgerald’s OPS was below .600 but he threw out 31% of base runners. The good news for the Mets was that after the season they were both included in trades for Carter and HoJo. Background: The 73 Mets nearly pulled off the upset of the decade. Despite a terrible start to the season, they made it to game 7 of the series before falling short. They had great pitching but light hitting. This was typified by their centerfielder. Forgotten Met: You may be thinking, wasn’t Willie Mays in center? Well sometimes. Most of the time it was the young Don Hahn. The Mets hoped that his bat would come to life, but it was very parve. In fact, Hahn’s OBP and slugging percentage were both under the .300 mark. While Mets fans remember many players on this team, Hahn isn’t one of them. Background: Had it not been for the Cardinals, the 85 Mets would have make the playoffs. They had a fantastic 98 wins. Not just that, but they were probably better than LA and certainly better than KC. They had a fantastic rotation and this solid pitcher is often overlooked. Forgotten Met: Ed Lynch didn’t have a great record in 1985, but he threw over 190 innings, had an ERA of 3.44, with a WHIP of 1.126. The problem is that he was an aging pitcher is a staff filled with budding stars. This is why most fans don’t remember Lynch all that well. 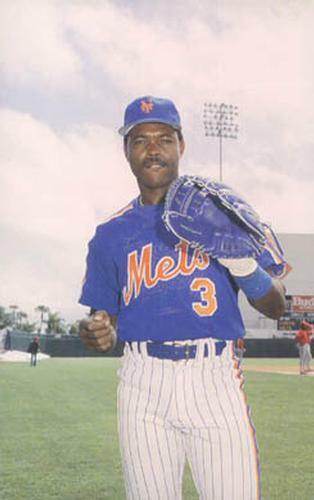 Background: When Rey Ordonez got injured the Mets tried to put Melvin More at short. It didn’t work and the front office traded Mora for a guy most fans would rather forget. Forgotten Met: Mike Bordick was a classic example of a guy who just filled a role. By Moneyball standards, he shouldn’t have been on the team. While his numbers in Baltimore were good, it probably had to do with the fact that he played in a bandbox. In Shea, Bordick provided little offense and unremarkable defense. After the season, he went right home to the O’s. Background: Sometimes history isn’t fair to good players. Some people are remembered and others are not. 1969 has one glaring example. Who was the primary reliever for the Miracle Mets? Forgotten Met: Many want to say that it was Tug McGraw. Tug was important but Ron Taylor led the team in saves and relief appearances. Taylor had an objectively great season. He didn’t give up a hit in his two world series appearances. In fact, Taylor had a really good career with the Mets but has been largely forgotten. Background: This entire team was memorable. They were stacked and guys all played as well as expected. Their was just one player with a key role that just took a spot on the team. Forgotten Met: Shortstop Rafael Santana is the definition of being in the right place at the right time. In his 4 seasons with the Mets, he didn’t do much well. He didn’t hit for average nor power. He didn’t draw walks. His range at short was minimal and speed was nonexistent. He is without a doubt the most unremarkable Met of the franchises most remarkable era.